This article, with an exclusive video interview, originally appeared in T.H.E. Journal's November 2013 digital edition. In 2007, when Colorado high school teachers Jonathan Bergmann and Aaron Sams began experimenting with recording their lectures in order to spend class time on deeper face-to-face learning with students, they probably didn't foresee the major movement that would grow up around what came to be called the flipped classroom. But six years later, the growth in interest remains exponential, suggesting this is far more than a fad. Just since January 2012, the number of active members on the Flipped Learning Network's Ning site has grown from 2,500 to more than 15,000. Members have formed more than 50 related topic groups. The nonprofit network, cofounded by Bergmann and Sams, also provides professional development seminars and conferences, and, according to Executive Director Kari Arfstrom, is "filling a gap in the education organization world catering to this growing need for information about flipped learning." • Will teachers make their own videos, curate others' material, or a combination of the two? There are plenty of good, short videos from websites such as TED-Ed and Khan Academy, and curation sites such as Sophia allow you to bring in videos, add PDFs, and use Google Forms to ask questions. One teacher recently told Bergmann that he could spend hours looking for the perfect video online or spend the same amount of time creating one of his own. "It really depends on whether you have the knowledge of how to do that," Bergmann says. "We need to have professional development for teachers to learn how to create videos." • What video-creation software should teachers use? Bergmann recommends that teachers start out simple, with a basic tool, but move to more feature-rich (and perhaps more expensive) applications as they get comfortable. • Bergmann believes that by far the most important question to address is this: What will teachers do with class time if they are not lecturing as much (or at all)? It may seem obvious that classroom activities will change, but no one is going to lay out a roadmap. "The important thing is to keep the lower-order things on Bloom's taxonomy to the videos and the higher-order things in class," Bergmann says. "That classroom time is the most valuable time we have with students." 2) Start small. Some teachers try to flip everything at once and end up feeling overwhelmed. Sherry Spurlock, a chemistry and physics teacher at Pekin Community High School (IL), says that if she had it to do over again, she would pace herself better. "I went out to Colorado and saw what Jon and Aaron were doing and came back and decided to flip all four of my classes in one semester," she recalls. "I jumped in all at once and nearly drowned. Making the videos was a very big time commitment. I would recommend doing it in smaller chunks." Jeffery Baugus, an algebra teacher at Woodlawn Beach Middle School (FL), agrees, and suggests that teachers create videos for their top few lessons and see how the students react before plunging ahead. He began flipping not as an experiment but out of necessity, he says. "Four years ago I was a new teacher and midway through the first semester, quiz grades started to drop and students were not having success doing the problems on their own at home," he recalls. "We needed to spend more time in class working on problems together." Given enough time, Baugus says, teachers should try to get more sophisticated with technology only very gradually. 3) Get student buy-in. Although teachers may be enthusiastic about flipping instruction, students may initially react negatively to being asked to watch videos or do other work outside of class. In her flipped class, Crystal Kirch, a high school math teacher in the Santa Ana Unified School District in Southern California, learned that taking the time to explain the pedagogy can have a positive impact. During her first year of flipping, she had some students complain about being asked to do this work outside of class--and some of them put in little effort. "This is so much different than what they do in their other classes that I wanted to get more student buy-in," she says. So in her second year of flipping, she took time to explain why she flips her class. She even included an explanation of Bloom's taxonomy and how traditional classes are focused on the bottom two levels of remembering and understanding, but that she was focusing on applying, analyzing, evaluating, and creating. As part of her plan to get more student buy-in, Kirch asked students for their thoughts about the flipped classroom. On her blog, she posted some of their answers, many of which praise the approach for making students parse their thoughts and summarize what they've learned. "Instead of mindlessly doing the math," explains one student, "I can actually think about it and understand it more in words, not just numbers." 4) Teach parents, too. Sherry Spurlock notes that her biggest roadblock to flipping was with parents who didn't initially get the concept. "They weren't seeing the value of it because it is not the way they learned," she says. Her solution was to start with parent conferences that focused on explaining flipped learning so that parents could get excited about it, too. Similarly, Kirch, who blogs at flippingwithkirch.blogspot.com, says she finds it valuable to engage parents. "At first, this was all new to them and they didn't know how to support me," she says. To get parents comfortable with the idea, she created a five-minute parent introductory video. She also e-mails an online newsletter to all parents. 5) Teach students how to watch videos. (Really!) Bergmann advises that teachers spend some time going over the basics with students. After all, "You don't watch instructional videos in the same manner as a popular film," he says. When he and Sams first started flipping, they gave class tutorials, letting students take turns controlling the pause button as other students took notes. They also used class time to work with students on how to write questions about the video as they watched. Kirch developed what she calls the WSQ ("wisk") framework, which stands for Watch, Summarize and Question. She started hosting her videos and assignments on Sophia, which allows her to embed interactive features using Google Forms. Students watch videos, making use of the pause and rewind buttons to make sure they understand what is being said, and take notes. They then complete a guided or open summary of the lesson online in a Google Form right below the video. She also requires them to develop a question to bring to class. It could be something they are still confused about or a general question about the concept they are studying. She created a WSQ chart to organize the activities and assignments that students need to complete for each concept. "I get a report on each WSQ assignment in an Excel spreadsheet," she says. "At the most basic level, I can track who has turned their work in, but I also get feedback about what students were most confused about. I check that before we go to class, and it may guide what we work on, along with the questions they came up with the night before." 6) Encourage (don't punish) students. Bergmann recommends that teachers avoid lecturing in class if they find that students aren't watching the videos. "If half of your students don't watch your video content, don't rescue them by teaching what is already in your video," he advises. "All that will accomplish is to tell the students who did the work that they wasted their time." He suggests having students who didn't do the homework watch videos in the back of the room while the other students get help on higher-level topics. This year he has started a "genius hour," based on Google's "20 percent rule," which gives employees time to explore their interests. "It is a time for them to innovate and work on anything they'd like related to math and are passionate or curious about," he explains. One student, for example, used his time to show how math related to card counting in casinos. 7) Don't use videos as the only engagement tool. Baugus recommends moving beyond a blog with just videos, because students may eventually perceive it as stale. He has moved to a WordPress website featuring multiple sections including a rundown of common errors and a Harry Potter-themed class competition. The site is also more responsive to mobile devices than a plain old blog. "A lot of our students watch videos from their mobile phones," he says. Spurlock also noticed that, once her school started making the Blackboard LMS available through Blackboard Mobile Learn, her students often preferred to access videos using their smartphones. 8) Make videos short and interactive. Bergmann says he and Sams initially took their standard lectures and made videos that contained multiple objectives and pieces of content that were way too long. Gradually they learned to make them much shorter, with one video per discrete objective. "My rule of thumb is one to 1½ minutes per grade level," he says. "That means for a fourth-grader, your videos should be no longer than four to six minutes; and for a 10th-grader, that means 10- to 15-minute videos." To address the length problem, Graham Johnson suggests breaking videos up into sections with interactive elements and a table of contents. "I realized that my videos were okay, but not great. They were one-size-fits-all," he recalls. "Once I felt comfortable with what we were doing in the classroom, I decided to go back and look at the videos again." He realized that, using Camtasia's video-editing tools, there were ways to make them more interactive. He calls his later creations "flowchart" video because they offer different directions for students to take, depending on how they answer quiz questions. For instance, if a student answers quiz questions incorrectly, he or she will be led back to the lecture section on that topic for review. It did take Johnson five times as long to create the interactive videos as the original ones, he admits, which created a considerable time burden. In fact, he has been working with Camtasia's developers, TechSmith, to see if there are shortcuts that could make video production less time-consuming. "But if I do it right, I should be able to use them again and again," he says. The feedback he got from students was that they were more motivated and more engaged with the interactive videos. 9) Find fellow flippers. If you are the only teacher at your school flipping your class, it can be difficult to sustain enthusiasm and get new ideas. But Crystal Kirch recommends that teachers turn to the internet to find teachers to collaborate with. "I jumped on Twitter and blogs and ran things by people so I didn't feel like I was stuck in my own little world," she says. "You can feel like you are alone, but there are people out there that are so willing to share." All of the educators we interviewed said the important thing to emphasize is in-class interactions. "A big misconception is focusing too much on the video," Kirch says. "Video is valuable, but it is just one tool. Flipping is defined by what you do in class and student-centered learning." Two years into his flipping experience, Graham Johnson has seen a real transformation. "Looking back, I think that the students sitting in rows and me at the front lecturing to them wasn't genuine learning," he says. "There was something missing." Instructional technology staffers can help teachers find the best solutions for their school's IT infrastructure. Most teachers who are all-in on flipping tie their videos and formative assessments in to their LMS to boost interactivity and allow for instant feedback from students, Bergmann says. At Clintondale High School in Michigan, every class is a flipped class, and software is not a one-size-fits-all affair. According to Principal Greg Green, "On the one hand, we had to take teachers out of their comfort zone, because what we were doing wasn't working. Students needed more support." But in the technology realm, he realized that Clintondale needed to make evolutionary changes that focused on ease of use for teachers. Green had his teachers start with premade YouTube videos and simple screencasting software such as Jing and Screencast-O-Matic. As teachers got more comfortable, they could move to more robust programs like Camtasia. For those who have difficulty making good videos, Green recommends a tool such as the FrontRow Juno lecture-capture system. It can record lectures during class and allow teachers to edit that material to be used for flipping. 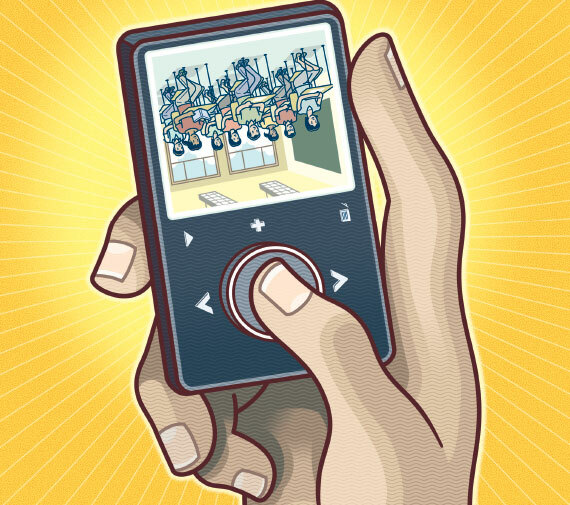 "With enough of those, you develop a nice collection of videos as you do your natural classroom work without having to set aside quiet time to record them all," he says.